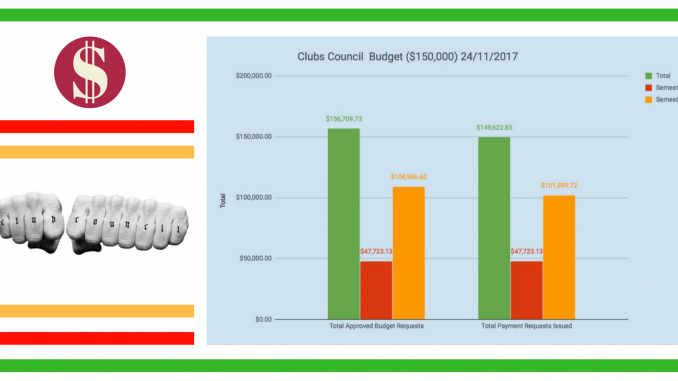 The Clubs Council has allocated 99.6% of its $150,000 budget to fund student Clubs in 2017. This represents a major success for the Council and an improvement on 2016. The Council is funded indirectly by SSAF through ANUSA. Under the SSAF system at ANU, unspent money is not carried through by the student organisations but rather returned to ANU, and under-spending is commonly understood to result in less allocation in future years. As such, budgetary success for SSAF-receiving student bodies usually means spending close to the budget while carefully staying within it. The Clubs Council has been offered a draft allocation of $175,000 for 2018, up 17%, which appears to largely be in response to their successful spending. In 2017 the amount was lowered from $200,000 to $150,000 after the now-defunct Grants and Affiliations Committee left much of the Clubs funding budget unspent. Of the $149,500 spent this year, the bulk was towards the latter part of the year, with $102,000 being spent in the second Semester. A number of new grants were instituted later in year, including the Student Life Discretionary Grant.